Some trends slowly fizzle out (freeze-dried astronaut food), while others morph into cultural fixtures (sorry, but reality TV comes to mind). Even gardening isn’t immune to trends; Chia Pets, anyone? But at least one current horticultural trend seems destined for long-term success: growing vegetables in containers. Once upon a time, gardeners grew veggies in the ground and flowers in pots, and that was that. Nowadays, though, a new generation of gardeners is eager to push old boundaries. Folks who live in apartments, condos and other tight quarters want to grow some of their own food, even if they lack a traditional plot for vegetables like their grandparents had. And gardeners everywhere appreciate the convenience and flexibility of raising edibles right outside their door — whether it opens onto a busy city street, a suburban neighborhood or a tiny balcony 10 stories high. “Container Vegetable Gardening: Growing Crops in Pots in Every Space” by Liz Dobbs with Anne Halpin is the latest book to address this popular topic. Whether you have space for a grouping of large pots or only a bare patch of exterior wall for a hanging container, the authors show — and tell and inspire — how to succeed at this small-scale yet satisfying approach. The authors also offer tips on specific crops, from the well-known to the unexpected. Mesclun and salad greens, for instance, are a popular choice for pots. “You can grow almost any edible leaf in a container and harvest it when young, using the increasingly popular ‘cut-and-come-again’ technique,” they explain. But they also recommend selections that you might not anticipate, such as corn. “This crop’s tall foliage brings a dramatic touch to containers and, although yields may be small, there’s nothing as sweet as freshly picked corn,” they write. The greatest inspiration may lie in the second half of the book, which showcases eye-catching combinations of plants. In “Small Bites,” for instance — which focuses on “even the tiniest spaces” — one particularly pretty combo is featured in “Flowers for Salads:” Golden calendula accents purple leaves and flowers such as basil and oregano. 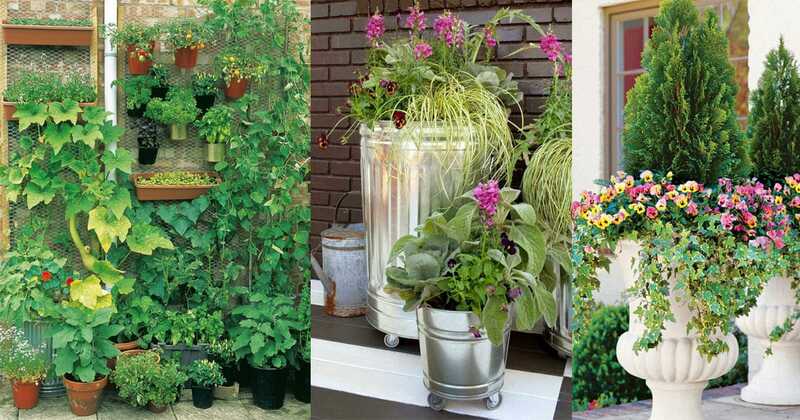 And even those with no horizontal space at all can squeeze in a container planting. “You can transform bare walls and fences into productive areas, thanks to planting pouches or pockets that are ideal for planting with a selection of different crops,” they explain. Now that’s a trend that even the least trendy gardeners can embrace.